It may not seem like it should cost so much to stand on a stage and tell people why they should vote for you. The answer comes with an elephant-size asterisk in the USA. 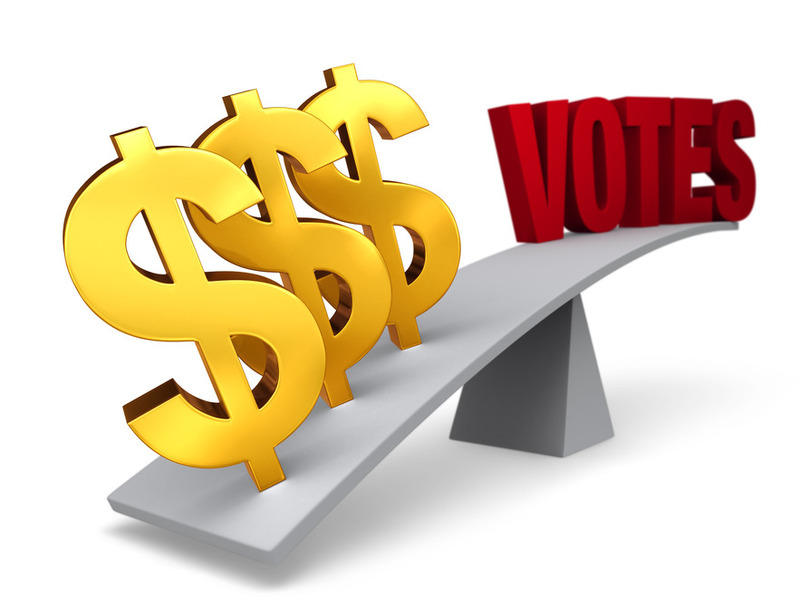 In 2012 the presidential election cost $2 billion, and this year’s election is expected to reach $5 billion! Trump himself says his net worth varies from day-to-day according to what mood he’s in. To outsiders, the US presidential election contest must look rude, vulgar, overcrowded, angry, stupid, and dangerous. The race for the White House can appear a ridiculous spectacle to the casual observer. In an age when knowledge is a mark of elitism, ignorance is power personified by Trump. He’s under the illusion that he’s 10 times richer than he is, believes President Obama was born in Brobdingnag to the Queen of Sheba and thinks childhood vaccination caused the movie Rain Man. Russia, China, Iran, Isis, the Taliban and Hamas will be paralysed with fear. Who knows what this lunatic will do? Thus, so far, Trump is the best America can do against his rival Hillary Clinton, who claimed she and her quarter-of-a-million-dollars-a-speech husband were “dead broke” when they left the White House. Hillary carries more baggage than the Boeing. After a seemingly endless parade of campaign announcements and abandonments, debates and stump speeches – not to forget weekly controversies born from the mouth of Donald Trump – the 2016 presidential election is finally upon us. On the 8th November. Finally, on the first Tuesday after the first Monday in November, well over a hundred million Americans will go to the polls to elect the next president of the United States. One of the world’s biggest un-popularity contests. To be sure, voters’ opinions could change over the next several months but the world is watching one of the biggest farce ever. But what does it all signify? So why is capitalism and its proponents not taking a victory lap? And why in the European Union are nativist, xenophobic and racist forces on the rise, as most visibly manifested with the Brexit vote? And why is the far right and far left in ascendancy in so many countries? Trump was formally crowned as the presidential candidate for the Republican Party, a position he won by deriding the political and economic establishments for caring not a whit about average Americans, and by mocking and showing no fealty to his own party’s nomenklatura. American like Europe Union has generated an enormous divide between the haves and have-nots. For the 1 per cent, corporate sector, banks, hedge funds and brokerage houses, the empire is working just fine. “Like in Rome it’s going to be ungovernable for the next 75 years.” And that’s because the domestic population is growing restless and angry with their increasingly desperate economic lot. This anger and frustration at the grassroots propelled Trump to his current candidacy for president, who has focused the rage at minorities, women and Muslims. Hillary Clinton will almost assuredly take over as president. “Democracy,” in America is the theory that the common people know what they want, and deserve to get it good and hard. No matter as the All-Seeing Eye on the back of the one dollar bill will still be the winner.